The Pelonis Signature Series PSS110P is a unique approach to high definition monitoring. The ANALOG system is based on dual concentric technology. The on and off axis phase and frequency response is unsurpassed as a result of the "Point Source" approach of the system. The system is proud to boast a completely "Passive" crossover network and custom "Analog" amplification. This "Purist" philosophy eliminates performance degradation of amplification devices that can occur as a result of vibration and close proximity to magnetic fields. 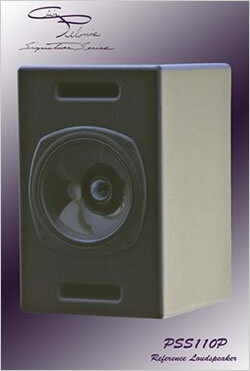 The system is offered with 400 watts of power from stereo to 7.4. The PSS212P dual 12" subwoofer and accompanies the PSS110P in the multi-speaker configuration powered by the choice of 800 watts – 1000 watts and extending low frequency response to 17Hz. To maintain the utmost fidelity, 6 low frequency curves are available. The slope and energy of the low frequency High Pass is achieved through 3 options of porting which is the "PHISICAL" portion of the adjustment. Port plugs are provided. The physical variations provide the following tunings. Both ports plugged ="Infinite Baffle", one port plugged ="Critically Damped" and both ports open = "Under Damped". In addition to the Physical control, there is a Passive 100Hz(approximately) filter switch provided. This filter can be applied to reduce low frequency boost resulting from boundary effect usually resulting from the distance from the floor to the speaker at the typical listening height. All of the PPLFC features provide the opportunity to adjust the low frequency to accommodate a variety of installations from flush mount to full space.